Mikasa might not be a first name that comes to mind when mentioning basketball, but that in no way means they have nothing to offer. On the contrary, their basketball apparel and equipment is on par with the rest of the manufacturers. We tested a Mikasa BX 1000 model and found that a 4.5-star user rating is well-deserved. This model is designed for outdoor use and it is one of the premium models in that category. In addition to doing the test ourselves, we asked some of the ballers we know and have them test this model as well. This is our combined verdict on BX1000. Outdoor courts usually have rough surfaces that have a major impact on the durability of the ball. 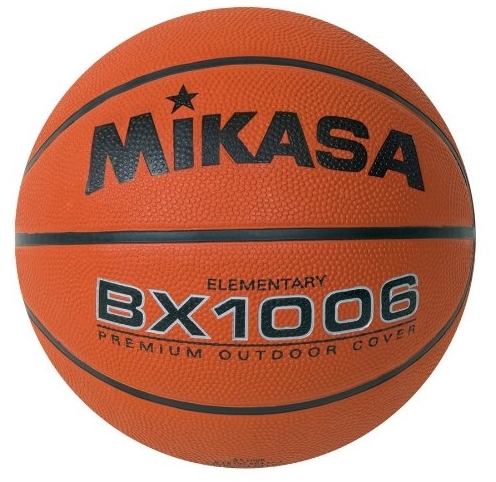 Mikasa took that into consideration and the BX1000 model comes with extremely durable rubber cover. This ball will easily last you way past the 1-year warranty period. The rubber surface is covered with a dense pebble design that makes this ball grippy. Even the players with smaller hands will have no problems palming this ball. This is really good for passing control or for street dunkers. We also notice that not much of the grip is lost when the ball gets dirty, which is a rare thing to find. Channels are a bit deeper than expected and it really helps a lot during the release. And we also think that deeper channels contribute to the overall longevity of the ball. The rotation of the ball is steady although we felt like this particular model is a bit light. Comparing it to the competition, it’s definitely lighter, but not considerably. The bounce is pretty much consistent and the amount of air plays a significant role in the ball’s behavior. Over/under inflating it can serve different purposes and the versatility of the ball really contributes to the overall package. The major upside to this model is that comes in a large variety of sizes. It is usually very difficult to find a premium outdoor basketball in sizes less than 6. We had no difficulty tracking even a couple of balls sized 4. The importance of this is quite big, as it offers a good buy for youth categories. We asked around a couple of Upward coaches and they all recommended BX1000. Since they are a bit lighter, they are certainly more suitable for kids who are just starting to get used to playing basketball and learning. Premium outdoors basketballs usually require a bigger than normal investment, but BX1000 is actually quite affordable. Taking into account the durability and the versatility of this ball, this is easily a smart purchase and we recommend it highly. And as always, keep ballin’.